What did a naughty Jewish girl, a Roman chariot driver and a field of Indigo have to do with the life of Jesus? You will learn the answers to those questions and more in Mary of Bethany, The Untold Story, by Kathy M Green. Mary first met Jesus by accident when she was in a place she should never have been. She would have been in terrible trouble if the boy Jesus had not shown up just in time. Travel the dusty streets of Jerusalem to Mary’s home in Bethany, visit places and meet people you may have never known before. See Mary and her family in a whole new way, Come, experience the life of one of the most famous women in the Bible, and learn her untold story. This book is fiction based on Biblical fact. Sign up for my email list to find out when I'll offer my books for free! sign up form on the right sidebar. "I am an old woman now but I can remember those days with Jesus as if they happened yesterday. There are others keeping records but I have personal memories of our friendship that no one will ever know if I do not tell them. I met Jesus when he was twelve years old. Not only did he rescue me from a very dangerous situation but also he gave me a bag of seeds that absolutely changed my life. Jesus, my siblings and me had many good times together before he ever became the great Rabbi and Messiah. Thank goodness, my father saw to it that I had a good education and encouraged me to keep written accounts of my adventures, mishaps, and relationships. It may only be a few special people who find my story, I hope they will share with me a relationship so unique and special that it changed my life forever. I know there are caves where the Essenes are storing accounts of our days with Jesus. I have friends among them who will add my story to the others that Jesus’ friends and followers have recorded." Available now on Amazon. Sign up for my emails (on the right sidebar) to be the first to know of sales, new books, etc. I always give my email subscribers an introductory Free Kindle book and a discount offer of the paperback version. My gardening book is available now on Amazon Step By Step Guide To Plant Propagation Revised Edition. It contains tips and tricks for rooting cuttings and ways with seeds plus other methods to multiply your plant collection. It’s a great little book for beginners as well as seasoned gardeners too. 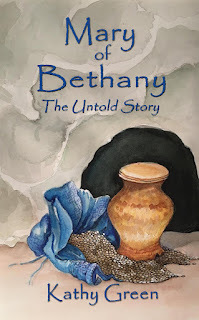 I'm also working on another Biblical Fiction Book. This one will be the story of Mary the mother of Jesus. Can you imagine what it must have been like to be a teenager in the first century with all the laws, rules for everything and suddenly you are visited by an angel announces that you are going to be the mother of God's Son? Think about being pregnant, engaged to a man who could have you stoned, trying to explain to your parents and friends that you are going to be the mother of the Messiah that had been promised hundreds of years before. I'll tell about her life before and after that event. We will go Bethlehem, visit with the Magi, spend several years living in Egypt and much more. I'll tell about Jesus early years with his family and see his ministry and life through Mary's eyes. Expect some surprises too. Not only do I write but my husband and I have edited and published books for others. I'm about to edit and republish my Dad's memoir. A sweet and funny story of a boy growing up in rural Alabama. He was one of the Greatest Generation, and his journals were a gift to me only months before he passed away. I haven't decided on a title for this one yet. Maybe I'll ask some of my blog readers to look at it and suggest a good one.